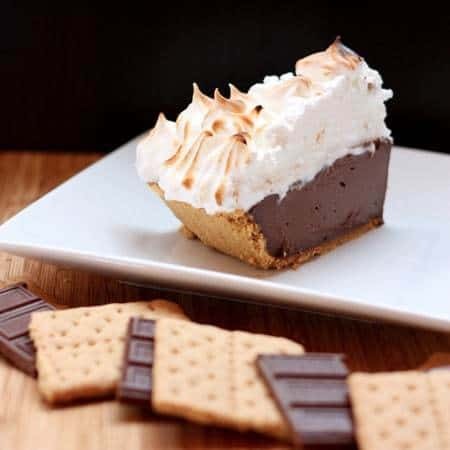 Prepare the pie as per the recipe for Hershey’s Creamy Milk Chocolate Pudding Pie, using a graham cracker crust. While separating the eggs for the four egg yolks for the pudding, set the whites aside for use in the marshmallow meringue. Place the pie in the refrigerator to chill. When the pie is completely chilled, combine egg whites, sugar, vanillam and cream of tartar in the bowl of your electric mixer. Place bowl over a pot of simmering water and whisk until sugar is dissolved and mixture reaches 145°F. Remove from heat and attach bowl to your electric mixer. Using the whisk attachment, beat on low speed until foamy, then turn up to high speed and beat until stiff, glossy peaks form. This will take several minutes. Preheat your broiler, or prepare a creme brulee torch. Remove the pie from the refrigerator, and spread or pipe the meringue over the pie. Place under the broiler for 3-5 minutes, or until nicely browned, or use your torch to brown the meringue. Muy, muy rico! Me encanta!